No single genre fan has it worse than the RTS fan. Oh, sure, I could make a case for the FPS fans, who don’t get nearly as many releases as everyone claims, and when they do, those games tend to be ultralinear, ultrascripted regenerating healthfests. But the RTS fans don’t even get that. The RTS fans straight-up, pure and simple, do not get games these days. Ugh, I’m going to sound like a grognard for this. Those two quotes come from Eurogamer’s review of Age of Empires II HD, a review which seems to constantly insist that, in light of new developments in the genre, Age of Empires II just isn’t a game worth playing. On one hand, I get it—the multiplayer’s buggy, but the reviewer talks about how the campaign is boring these days, or how the game’s features aren’t that worthwhile, or all this other stuff... and I can’t really agree. 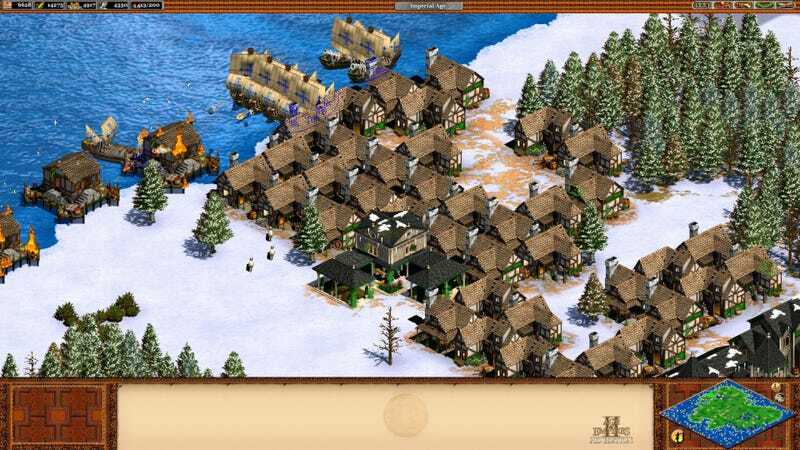 When playing Age of Empires II HD, I was charmed by the sprites. I’d been messing around in Age of Empires III recently, and it just wasn’t fun to play, and, looking back at it, I think the game’s use of 3D was part of the reason why. Jumping back into Age of Empires II HD changed everything for me. With the exception of stone cliffs, I think the game looks pretty attractive. The sprites are delightful to me—suggesting that they look bad is just a bit like suggesting that a game like Fez or something is unattractive because it’s got a retro art style. Frankly, I think Age of Empires II HD is great fun and looks rather good—I’ve put 46 hours into the game, according to Steam, which doesn’t count my offline time. I’m only just now working through the Barbarossa campaign, which leaves me with Attilla the Hun, Montezuma, El Cid, and “Battles of the Conquerors,” not to mention the new campaigns that will launch when Forgotten Empires, the mod-turned-official-expansion, releases this fall. And there’s nothing out there that plays quite like it these days. Gone, it seems, are the days of base-building, of unit-micromanagement, of gathering resources, of researching new technologies, of lengthy games with multiple campaigns spanning a variety of races or cultures. Now what we’ve got… well, it’s different, more board-gamey. Is iteration progress? Can an idea have so much iteration that it ceases to be what it is and becomes something else entirely? After Age of Empires II HD, other great series like Total Annihilation and Command & Conquer virtually disappeared, though CnC returned as a dessicated husk of its former self several times, and it will now be releasing as an online-only, F2P title. Total Annihilation was semi-resurrected with the awesome Supreme Commander, but Supreme Commander 2 is a game so bad that it has more mixed and negative user reviews on metacritic than positive ones. Relic’s always been interesting. Dawn of War was a great, classic RTS based in the bleak Warhammer 40,000 universe, Impossible Creatures let you capture various animals and fuse them together to create mutant hybrids that would do your bidding, and Homeworld, well… Homeworld was a fully 3D RTS set in space, where the player focused a bit less on resource gathering or base building and focused a lot more on resource management. So maybe it shouldn’t have been a surprise when Dawn of War II became a game more akin to a MOBA or a Loot-Grinder, giving players control over only a few units, focusing more on simply running around a map, capturing points, and killing dudes. Some people enjoy it. Me, I’m not really wild about how much more simplistic it is; playing Dawn of War II doesn’t really seem to require thought—you just spam units at a particular point, send a blob of soldiers at whatever your objective is, capture it, and move on. Company of Heroes, Relic’s other big franchise, has you converting existing buildings to train units, capturing points, and dealing with things like suppressive fire and taking cover. It’s a more strategic game than Dawn of War II, and the multiplayer experience is said to be really good by its players, but… I dunno. It’s an iteration upon whatever Dawn of War II was. There’s no base-building, no resource-gathering, or anything like that. You’ve got to be a bit more thoughtful about what units you spawn and where you send them, but that’s about it. It’s a different sort of game entirely. Trying to compare the experience had when playing a game like Age of Empires or Supreme Commander to a game like Company of Heroes or Dawn of War II is like saying that Legend of Grimrock and Unreal Tournament are the same games because they share the first-person perspective. Relic’s work birthed something new in the genre, and they weren’t the only ones. The Total War games used resources gathered taxing an empire during the game’s turn-based empire section to buy armies of soldiers—not individual soldiers, but entire armies. More realistic, perhaps, than the classical RTS, but, again, the gameplay’s a very different thing: during the battles, players position entire armies tactically, point them at whoever needs fighting, and basically says “go murder everyone,” so they do. They’re fun, absorbing games, and absolutely deserve the ‘Game of the Year’ nods they seem to get just about every year they launch, but, again, they’re a different sort of game entirely. And the thing is, most RTSes aren’t that sort of… classic RTS approach anymore. World in Conflict, a game I absolutely love and would really like to see get cloned, had its players using an allotment of points (increased after certain objectives) with which they could buy units, which would allow players to parachute units into a map. Its camera controlled like an FPS’s noclip command. Age of Empires Online is an MMO that has RPG-like quests (including elements of grind) and grants the player XP for just about every action the player might do—it’s a fun game, but it can’t be played without a connection to the servers which will be shutting down next year. Plus, playing multiple campaigns takes forever because of all the introduced grind. It’s not a very focused game in the least, and many of the missions I’ve played so far are centered less on city building and more on spamming a lot of units. It’s a varied, even fun game, and is somewhat close to the classic Age of Empires experience, but the F2P, online-only design really hampers the game. Command & Conquer’s Tiberium Alliances, an MMO like Age of Empires Online, launched last year, and this fall’s Command & Conquer will be another F2P game, though it’s not yet clear how it will differentiate itself from Tiberium Alliances. The awesome-looking Planetary Annihilation is a multiplayer-focused game that does some really cool things and builds on the ideas from Total Annihilation and Supreme Commander… I mean, these games are cool, right? Don’t get me wrong. I count a few of them among my favorite games ever conceived. But, well, so is Age of Empires. So are a bunch of games that feature rich campaigns, awesome skirmish modes, a balanced focus on resource management, city building, and… well, yeah. RTSes, or, rather, what I think of when someone says RTS. You may say “Doc, you think too narrowly, and all those other games can, and should, be considered RTSes,” but so what? Whatever they are, they’re different. If I go to a grocery store to pick up some barbecued pork and you give me deli ham, and I say “this isn’t what I wanted,” the grocer’s not going to say “hey, don’t be so narrow-minded, man. It all comes from a pig,” because the grocer knows that they’re two very different things. There’s a great deal of thought that goes into this. And it’s not the same kind of thoughts that players have when playing the other kind of RTSes. It’s not about “I will place this building here so that my resource gatherers can do this efficiently,” or “I will build these walls, causing the enemies to walk through a maze and die before they ever even approach the area I’m defending. What is a genre if not a distinct way of thinking about and interacting with a virtual environment? So if that way of strategizing and interacting changes, then surely the genre’s changed as well? I miss the classic RTS, I really do. I don’t think that the genre has evolved, so much as it has transformed into a bunch of different experiences that all do very different things, and the sort of… classical experience is just about dead, with the exception of Starcraft II, a game that isn’t worth playing unless you want to play competitive multiplayer. The JRPG fans are still getting JRPGs—even remakes of classic games. The FPS fans might be getting the short end of the stick, since most people think FPSes are dumb bro-games (they’re the smartest, most thoughtful games out there, more often than not) that are too popular and totally lame. One might argue that Action Adv—actually, no, no one argues that the most common genre out there that has entries in most of its most popular franchises on a consistent basis with new franchises coming out all the time is having a hard time of it. Racing’s got its’ arcade games like Forza Horizon and Need for Speed, with more sim-oriented games like Forza and Project CARS. Sports games are practically guaranteed an entry every single year. Classic genres, like the RPG, the Space Sim, and the Adventure game finally making a comeback with games like Wasteland 2, Project Eternity, Elite: Dangerous, Star Citizen, and Broken Age, and some developers are trying bold new things with these genres in the form of games like The Witcher 3. I suppose you could make an argument for the Immersive Sim, which kinda forgot that it’s supposed to be a sim and got stuck trying to be all gamey game stuff*, but even then, we’re getting games like Dishonored. The God Game’s coming back in the form of 22 Cans’ Godus, though reaction to it has been mixed, to say the least. Other games like Syndicate, which didn’t really have its own genre, are seeing spiritual successors. Nah, if there’s one genre that deserves better than it’s got, classic RTS experience. I really do believe there’s a problem with the suggestion that change is improvement. I don’t think becoming an MMO has benefited the Age of Empires franchise (and the fact that its developers have closed down and the game itself will be shutting down in a year would seem to indicate as much). I don’t think that the ‘capture the point and focus more on squads’ philosophy that’s driven Relic’s development since 2006 or so has improved the RTS so much as created a new kind of game, and the same’s true of the Total War genre of game. Ensemble is no more. Gas Powered Games is dead. Kickstarters for legions of dead genres or spiritual successors have arisen, but the RTS remains strangely silent. What should have been a triumphant return for the classical RTS in the form of Age of Empires II HD ended up getting a lot of bad reviews from journalists who seem to think that it’s not very good because it didn’t suddenly change into one of these other experiences. Is change always good? Did the third-person shooter suddenly become better when jumping was removed, cover was implemented, and cameras ended up putting the character on the left side of the screen? Some might argue that this homogenized the genre, meaning that games like Max Payne or Giants: Citizen Kabuto couldn’t really come about. What about the FPS? Did the addition of vertical look and jumping improve shooters? (yes, because they increased the ways players could interact with a 3D space) Should all shooters have adopted regenerating health and ADS mechanics? Well, ADS slows down the game by slowing down player aiming when they’re looking down the sights, and regenerating health creates a slower, more gunfight-oriented play style, so the answer is probably no. Some games definitely benefit, like Call of Duty and Bulletstorm, but other games most certainly do not (like Halo and Unreal). How about the isometric RPG? Dragon Age: Inquisition is bringing the tactical camera back because players demanded it, quite likely because there’s a very different way of thinking in Dragon Age: Origins while using Tactical View than there is in Dragon Age 2. Many would argue that the removal of tactical view was not an overall improvement on the game, because it changed the way gamers interacted with it. The conclusion, then, is that change isn’t inherently good, it’s just… change. And a genre I love has changed just a bit too much for my liking. Hopefully, one day, we’ll get our RTSes again. For now, I guess I’m just gonna go mope. No post tomorrow, see you guys next week! If there’s a subject you want me to explore, or a game you’d like me to talk about, let me know what it is, and if I own it or have played it, I’ll try to write something interesting! You can follow me on Tumblr or Twitter. *MGS-style third-person stealth in Deus Ex: Human Revolution is a massive downgrade from the stealth found in games like Thief.